I am always on the lookout for a great hot sauce, or superior hot mustard. 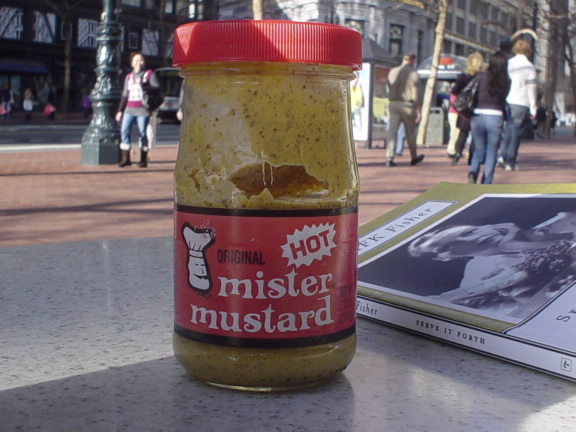 Strolling through the Winter Fancy Food Showcase in San Francisco, California in January, I discovered THE hot mustard. The name is simple and to the point: Mr. Mustard-Hot. Mister Mustard-Hot has the brain numbing, sinus-clearing experience lovers of hot mustard crave, but it also has a great taste which brings out the sweetness in meats, and adds a nice kick to sauces. I put it on roast chicken, bacon, and red leaf lettuce, all sandwiched between toasted sour dough bread, lacquered with really good mayo. I drop the mustard on the meat in little dollops so that when I press the sandwich together the mustard spreads out unevenly, giving me nice pockets of mustard, or no mustard in each bite. I like this teasing of my taste buds, hide-and-go-seek for the spicy bite. Mr. Mustard-Hot puts those chi-chi French Dijon mustards to shame. If you can find Mr. Mustard-Hot in your city, or anywhere else, buy it. I promise you once you have tasted Mr. Mustard-Hot you will throw away that other stuff you call hot mustard.